The art of writing a Christmas special isn’t easy. Whatever medium you’re working in the need to avoid mawkishness, sentimentality or twee cliche is a tricky one to get right, so what do you do if you are Britain’s leading sci-fi comic? 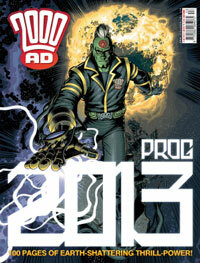 Well in the case of the 2000AD Christmas Special they have gone for quantity rather than seasonal themed merriment. This bumper issue features 100+ pages, to keep you going over the festive period, and is packed with the usual high quality action adventure you would expect. With several epic stories coming to their conclusion in the last few months, new series and story arcs begin with this issue, and so there has never been a better time to get into 2000ADThey haven’t completely ignored the time of year though and There is one story which acknowledges the festive period, and that is with the star of the show, Judge Joseph Dredd. Still reeling from this years epic Chaos Riots story and in the immediate aftermath of the Chaos Bug, this issue’s little slice of a Dredd is what 2000AD do so well (and that the recently launched IDW title has struggled with) and that’s create a story that features the core characteristics of Dredd, but without him being the centrepiece. Dredd is as much about the people of Mega City One as it is the lawman himself, and this notionally festive tale that sees him taken in and looked after by some escaped convicts from an old Iso Cube unit, takes the optimism and charity of the festive period, but steers clear of ramming seasonal cheer or anti-religious satire down your throat and ends up creating a really simple, yet effective bridge from one Dredd year to the next. The book is then filled out with a great Ack-Ack Macaque story (who doesn’t love a machine-gun-totting ape?! ), the delightfully sinister Absalom: Dirty Postcards ( a creepy slice of supernatural whodunnit), a brutal slice of dystopian Britain with Savage, religious/sci-fi/historical hybrid Aquila Quo Vadis Domine and the brilliantly stylish Ampney Crucis Investigates. Not forgetting Victorian naval adventure The Red Sea, alongside a new instalment of Henry Flint’s gruesome The Visible Man and the continuing adventures of Johnny Alpha in Strontium Dog. With many of the series beginning new story arcs with this issue and with sketch pages from all the stories available in the digital edition this is an excellent festive issue, that should keep new readers and regulars alike more than satisfied well into the new year.